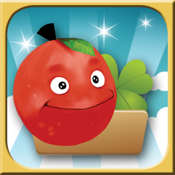 "Tiny Fruit 3D" is a 3D Casual Game.In game, you need a good balance to control iphone. By iphone built-in gravity induction, the Fruit Picker can move ASWD according to the direction where you shake iphone to.Hold your iPhone parallel to the floor to stop picker move. You can also get Free LITE Version. Move picker by built-in gravity induction. For your best gaming experience,Keep iPhone parallel to the floor.